At ArtFactory.com, we specialize in designing and building custom furniture based on designs from history. These are not reproduction quality products, but are original works of art built using the same techniques and materials that were used to construct the originals. This custom Western Style dresser is designed and built in Scottsdale, Arizona in a true old western style. The main body is constructed with mortise and tenon, peg and dowel construction, and as shown is made from thick, solid cedar cypress. That means genuine, full length timber, never particle boards are veneers. When we say wood, we mean "The Genuine Article". The hand forged, iron frame and legs are built with hammer and anvil by the hands of our master blacksmiths. The western style ring drawer pulls are meticulously crafted to fine art standards like all of our handles and hardware. Hand forged iron rivets provide additional strength and durability. The decorative wagon wheel and ornamental hand forged horseshoes add that extra bit of flare to the Western style theme. These ornamental elements, along with the custom, twisted iron mirror frames have also been hand hammered by our master blacksmiths. The drawers slide on full extension, easy glide tracks for a smooth and quiet opening and closing experience. It also includes mar proof and includes leveling feet. This unique custom dresser is is part of our Western Style bedroom set, and can be made in any size or finish. It is a perfect companion to our Western Style wagon wheel bed. You can even make it a full room with matching armoire and nightstand. Exception: Original grain matched show room sets are for sale as built will not be sold separately. The custom Western Style dresser is available by itself, or as part of our complete bedroom set that includes our Western Style wagon wheel bed. Also available with matching armoire and nightstands. This custom Western Style dresser is finished inside and out using a many step open grain color infusion process. These finishes are hand rubbed, with curing times between each process. This includes multiple steps to infuse the stain colors into the grain of the wood. Additional, multiple processes of lacquer, waxes, and oils allow the finish to be part of the wood not just on the surface. This allows for by simply cleaning with oils to create a natural patina that will improve in appearance over time. We offer hundreds of different finish color choices. Unlike paint, sprays, or urethanes these finishes will not fade, flake, or chip over time. All of this adds up to a finish that meets world class fine art specifications, and will stay beautiful for generations with little or no maintenance. The custom Western Style dresser, and all of our products are designed by, built under the supervision of, and signed by award winning artist H.J. Nick. This signature certifies that all aspects of your product have been found to meet world class fine art qualifications. This makes for and investment quality piece that will have future appreciable value in antiquity. Our combination of fine grade materials, and master craftsmanship allow us to offer a quality of product that is unmatched anywhere at any price. In fact, we are so confident in the quality of our products that as a result we guarantee everything forever. Call us today at 1-800-292-0008 for pricing on our custom Western Style dresser, or any of our fine art quality home furnishings. Bed Styles - headboard, foot board, sleigh, four poster, canopy, tester, etc. 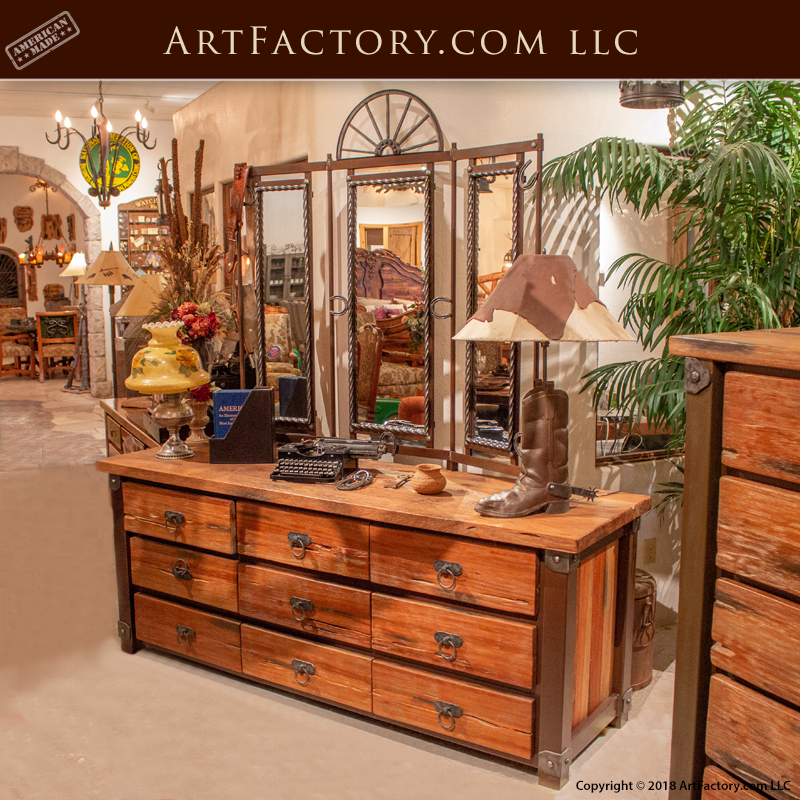 ArtFactory.com is a custom furniture, door, and gate manufacture based in Scottsdale, Arizona. Featuring designs by H. J. Nick, we have been designing and building some of the world's finest furnishings all handcrafted in America since 1913. Most of our clients want a furnishing that has a big WOW factor and timeless elegance. They all want investment value furnishings that makes a proper statement reflecting their personality, or the personality of the environment for which the designer custom furnishings is intended.